I got a little behind on my comics reading, so I’ve just now caught up with what’s going on in Jeph Loeb’s Hulk. I have reservations about it, but I’m enjoying it in general. I’d much rather read something by Jeff Parker, Greg Pak, or Fred Van Lente, but between the silly, trying-too-hard wackiness of Loeb and all the talking and off-panel fighting that Bendis and Millar crank out, I’ll take Loeb without even having to think about it. It’s obvious that he’s having a blast writing this stuff and it’s infectious enough that I’m enjoying it too. What I just read was Hulk #s 7-9. 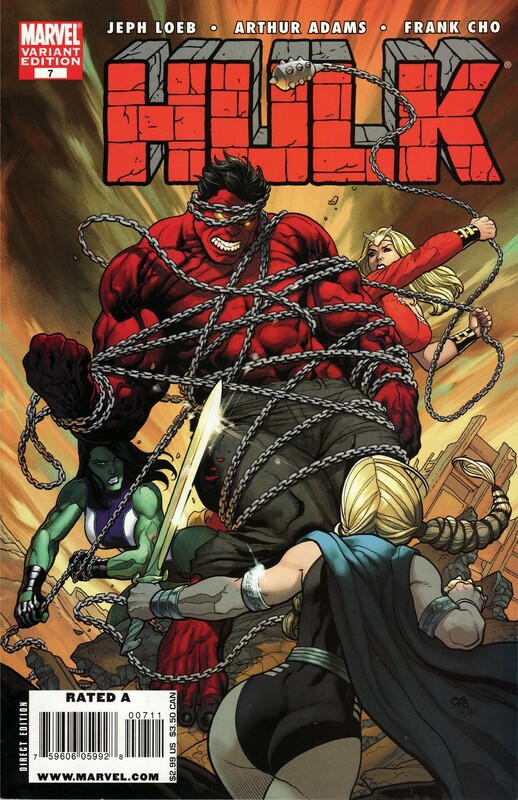 I think it’s very cool that they’re splitting up each issue between the Green Hulk and the Red Hulk (I refuse to refer to him by the stupid codename they give him in the comic; one of those reservations I was talking about). It took some getting used to, but if that’s what it takes to get a monthly (or so) dose of Art Adams and Frank Cho interior art, I’ve got zero complaints. These guys are fantastic artists, but notoriously slow. Letting each of them draw half a comic a month was a genius move. Someone deserves a raise for that. I’m going to focus mostly on the Red Hulk story here because that’s the one that features She-Hulk and she’s the reason I’m writing this post. But the Green Hulk story deserves mentioning if for no other reason than Art Adams is drawing it and holy crap it’s good to see that. Again, Loeb wants so badly to be awesome that he throws all kinds of things into the story (like Joe Fixit, mutated Wendigos, Moon Knight, etc. ), but he does so mostly without any credible reason. That’s where he falls short of the Parkers, Paks, and Van Lentes. Those guys bring the awesome, but their stories still make sense at the same time. But, back to the Red Hulk. 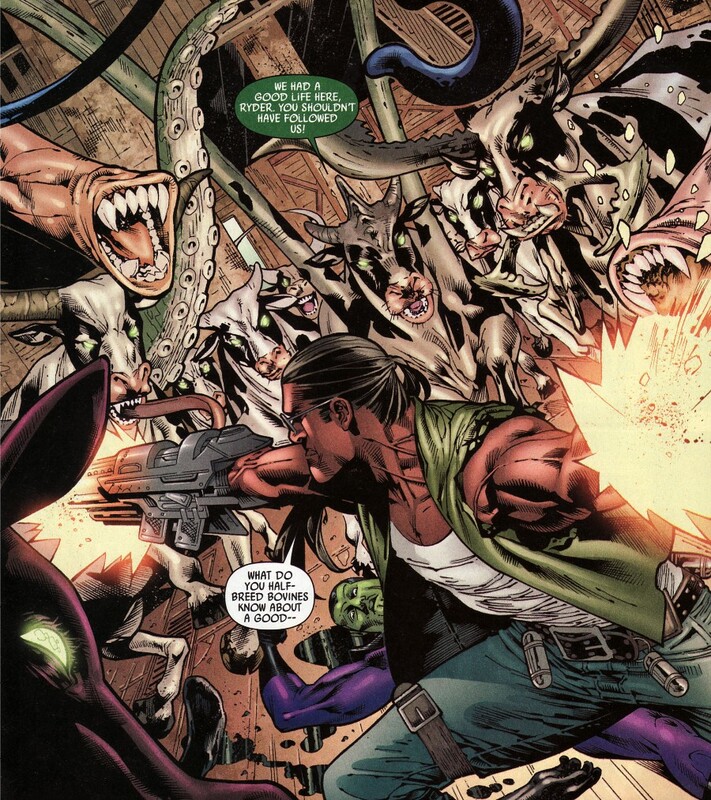 In issues 1-6 of the series, S.H.I.E.L.D. was trying to bring down the Red Hulk and threw everyone they could think of against him, including Thor and She-Hulk. 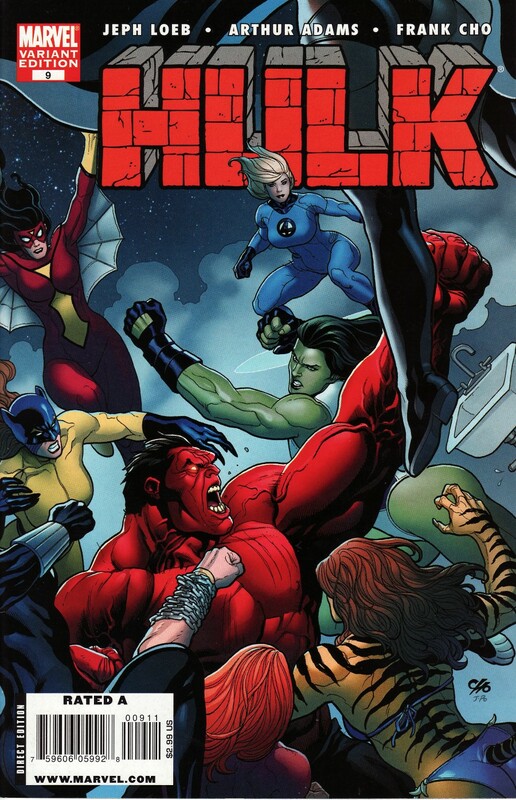 The Red Hulk’s tough though and was able to beat them all. Difference between Thor and She-Hulk is that Thor was able to shrug off the defeat and go about his day as long as Red Hulk was ultimately defeated (which he was, temporarily, by Green Hulk). She-Hulk, on the other hand, let her smack-down eat at her, so when Red Hulk went missing again, she volunteered to go after him and deliver some payback. Thing is, she knew from experience that she couldn’t deliver it by herself, so she pulled out her Rolodex and started calling every other female superhero she knew. This is where it starts to get good. Or at least interesting. No, that’s not fair; it’s good. Wait and see. A lot of the girls were busy with other things, so She-Hulk ends up with just Thundra and Valkyrie. Not too shabby, but not exactly an army either. Calling themselves the Lady Liberators (after an old Marvel team that Valkyrie sort-of-but-not-really used to belong to), they catch up to Red Hulk at Mount Rushmore and fight him. There’s some silly stuff like our supposing to think that She-Hulk’s in danger because Red Hulk wraps a chain around her neck and dangles her over a cliff. Please. If She-Hulk’s neck-muscles can’t deal with hanging… Fortunately, Valkyrie and Thundra put a stop to it before we have to think about it too hard. 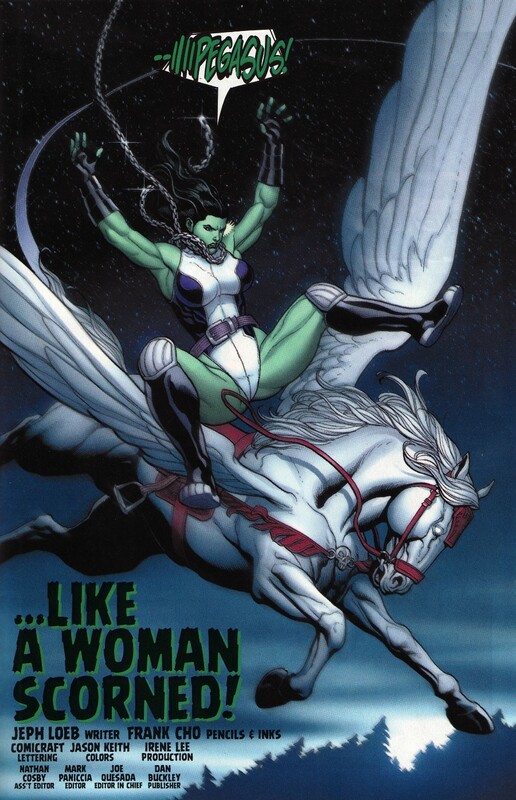 Then Valkyrie has her winged horse rescue She-Hulk from the drop and She-Hulk calls it the wrong name. Anyway, I’m not up on current Valkyrie continuity, so maybe she’s got a new horse, but her mount used to be named Aragorn. Maybe that’s not as cool as it once was now that everyone knows where Marvel stole the name from (possibly why Sauron doesn’t menace the X-Men much anymore either?). I choose to believe that She-Hulk either didn’t know the horse’s real name or forgot it in her panic over falling. Where’s my No-Prize? Or am I just behind and the horse really is called Pegasus now? I’ll try not to spoil anything more except to say that we’re reminded that a) Red Hulk is actually a pretty smart guy and b) one of the Lady Liberators has a background as a villain. I’ll probably say more about that second one when I talk later about what’s going on in She-Hulk. But for now I just want to point out a couple of things about She-Hulk and what this story says about women super-heroes (and women) in general. 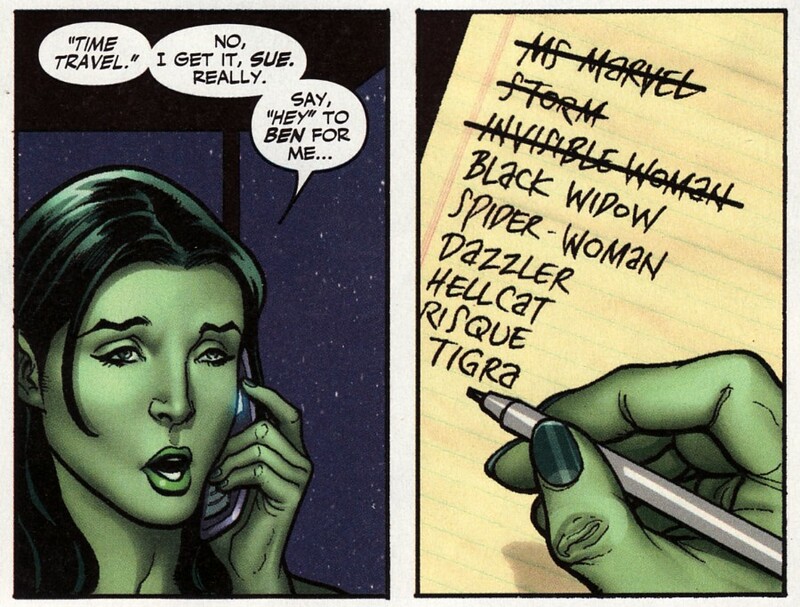 First, She-Hulk does a lot of whining in this story. She complains way past the point of annoyance about how infuriating it was to get beat up by Red Hulk. Seriously, I just wanted her to stop. Getting Valkyrie and Thundra to join her was all so she could pay Red Hulk back for defeating her. Except, how much payback is it when you have to call in help to deliver it? How is that satisfying on a personal level? Stay with me here, because there’s an answer and – I’m pleased to say – Loeb is the one who supplies it. She-Hulk has a voiceover at the beginning of issue #9’s installment that lets us know that this isn’t a matter of personal pride for her. It’s a gender issue. As someone who likes reading about women heroes, I hadn’t really questioned why all the people She-Hulk called were female. I figured it was just about Loeb’s having a cool idea and running with it as usual. But this time there’s a real reason. 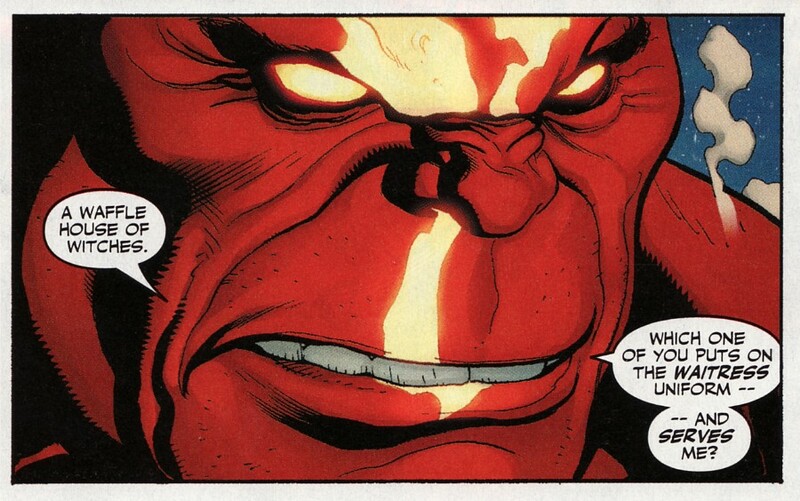 Red Hulk isn’t just an evil strongman; he’s a misogynistic pig. Loeb goes out of his way to show that over and over again. Of course he’s infuriating to She-Hulk. Of course she’s pissed off that she can’t physically make him stop. Of course she’s going to call in her badass girlfriends to teach this scumbag a lesson. I’m starting to like Red Hulk now. I didn’t at first. I thought he was another of Loeb’s crazy, half-formed ideas and I was ready to move past his story. But the longer he stays around, and the more infuriating he gets, and the more it becomes clear that he’s really not going to go down easily; the more I absolutely hate him. And I’ve realized that I love hating him. I’m not going to insult women by saying that a male writer has taught me to finally see the world through women’s eyes, but I will say that I get now – in a tiny, tiny way, but in a way I never thought much about before nonetheless – why a lot of women I know are so frustrated by the imbalance of power between the genders. These characters (fictional and scantily clad as they are) are strong characters, physically and – for most of them anyway – in other ways as well. It’s maddening that they can’t seem to get the upper hand on this guy who hates them because they’re women (or at best, only sees worth in them as objects for his sexual gratification). I feel like I need to apologize for giving this much credit to a super-hero story, but screw it. It made me see something in a way I hadn’t before and – for all its flaws – that’s pretty cool. I’m not going to take that away from it. 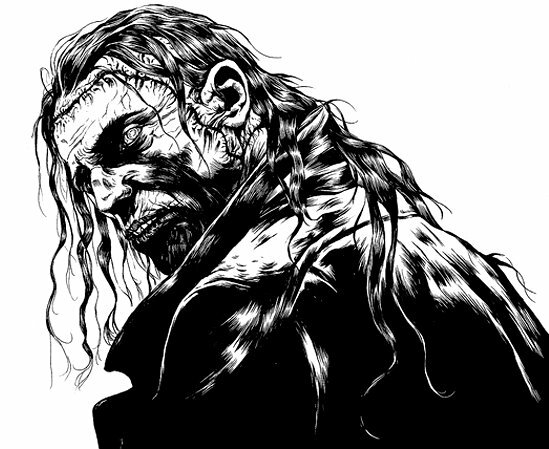 Art from Warren Ellis’ Frankenstein project by Marek Oleksicki. I love how faithful it is to Shelley’s description. 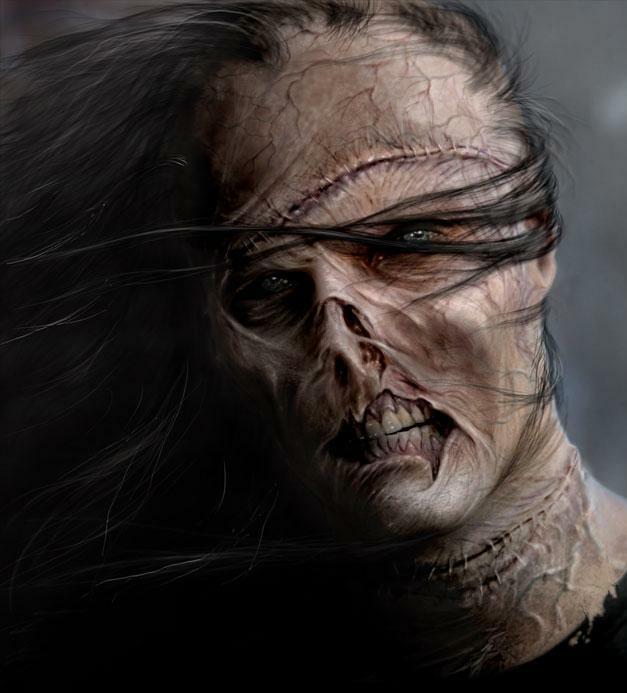 Concept art by Gino Acevedo from the film based on Steve Niles and Chee’s modern-day retelling of the Frankenstein story. Another faithful depiction. Oh, and as long as we’re talking Frankenstein, check out this short interview with actor Doug Jones (Abe from Hellboy) about Guillermo del Toro’s planned Frankenstein film. 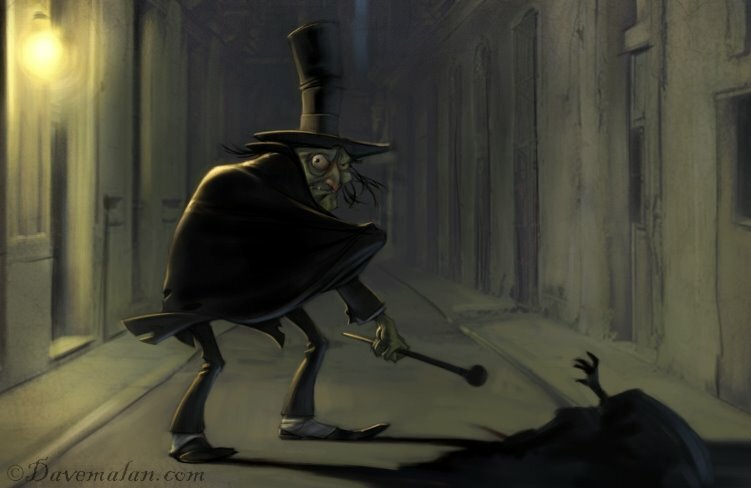 Jones wants to play the Monster and there’s a strong chance that this version’s depiction of the creature will be yet again faithful to Mary Shelly’s description. 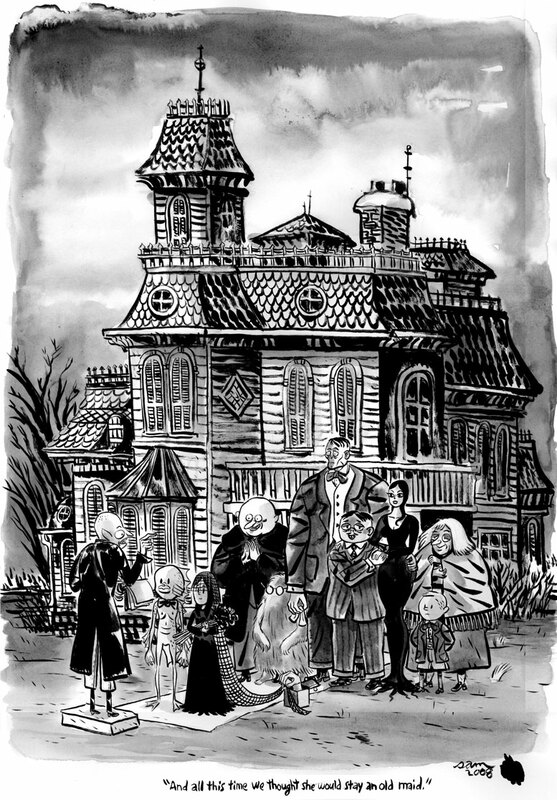 Turns out that del Toro is a big fan of Bernie Wrightson. Notice how Roger Moore is the only one who has to use both hands. It’s Rudyard Kipling‘s birthday today. 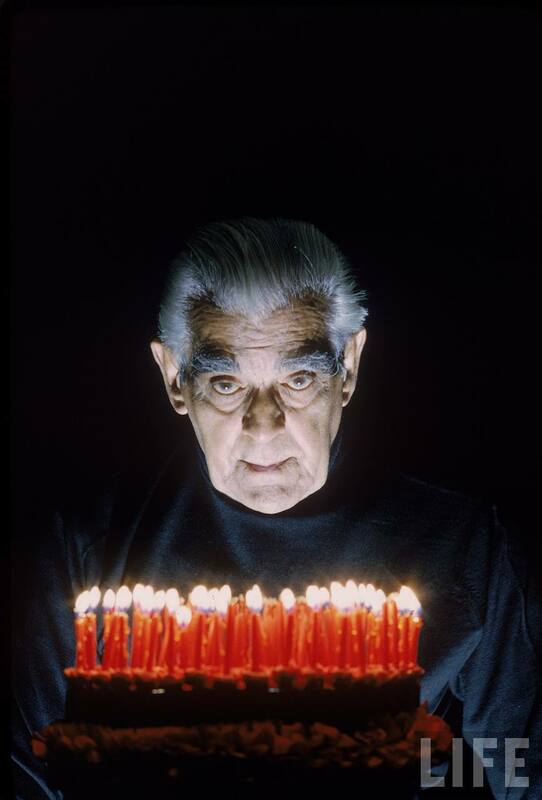 He would’ve been 143. 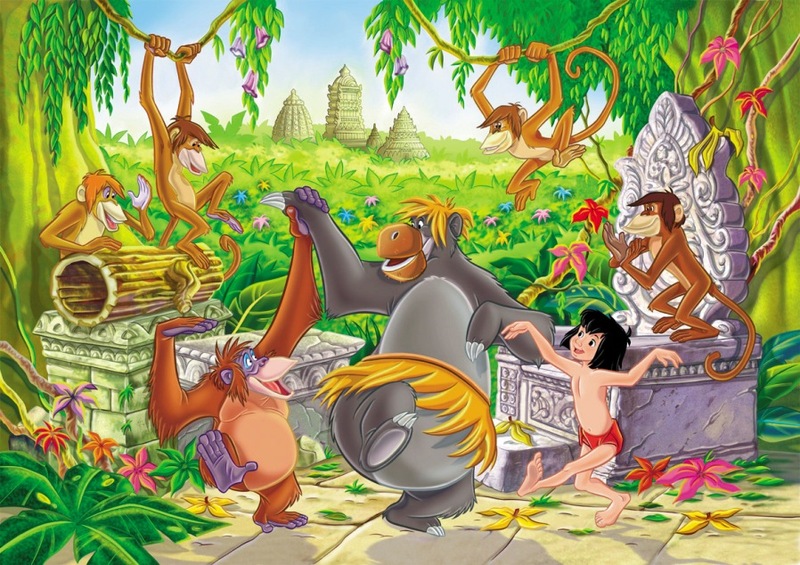 In his honor, I think we should all find orangutans to dance with. It’s been too long since the Agents of Atlas mini-series. Their occasional appearances around the Marvel Universe have been awesome, but I’d completely forgotten about the idea that they’re a bunch of good guys posing as a bunch of bad guys. They’re the anti-Thunderbolts. 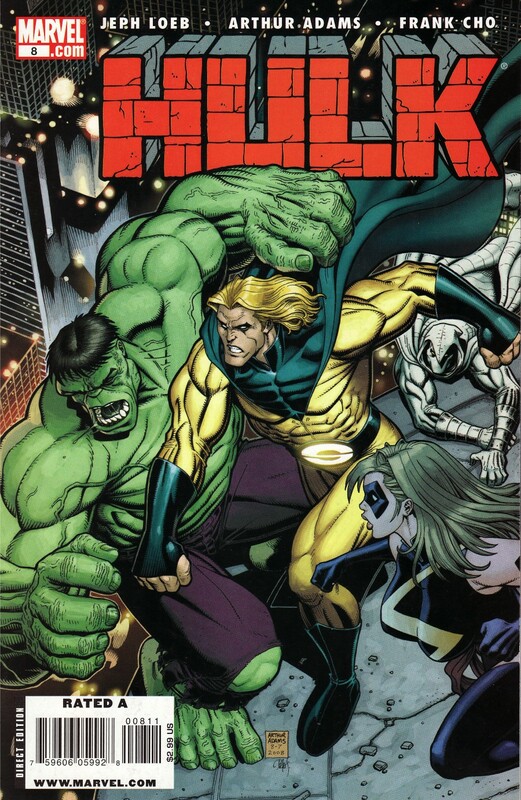 Or the anti-Dark Avengers as it were. It makes more sense now that Marvel would launch their ongoing in the same, massive breath as Dark Avengers. (Not that I needed a logical reason for Agents of Atlas to be part of that launch; I’m just extra thrilled to be connecting the dots). The Agents story in Dark Reign: New Nation is a beautiful piece of work. It’s packed with stuff about the Agents’ robbing Fort Knox and uncovering enough of Norman Osborne’s plans that they want to know more. Ain’t no doubt that an Agents of Atlas/Dark Avengers meeting is imminent, but even though the Dark Avengers sound lame (Iron Patriot? 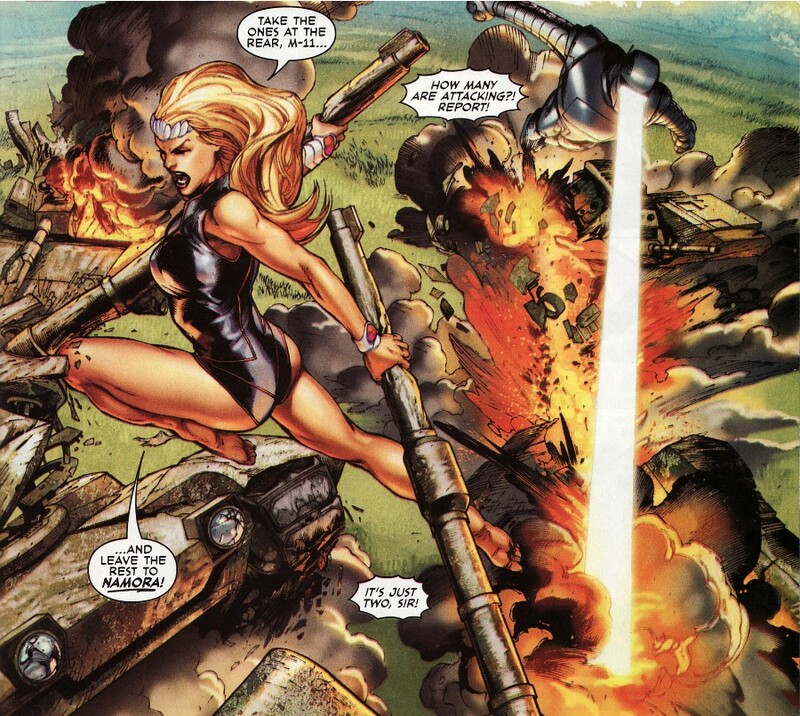 ), I’d love to see Namora, Gorilla Man, and the rest of the guys be the ones to bring down Osborne. The story here does exactly what it’s supposed to: gets me craving more. Contrast that to the dreary, drowsy Secret Warriors story, which is nothing but Nick Fury reminiscing about Captain America for eight pages. No way I’m interested in an ongoing full of that kind of writing. 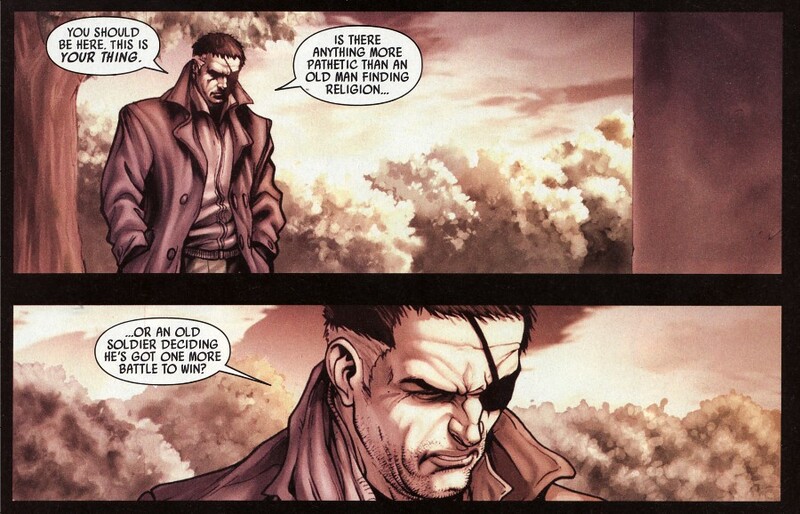 Or in New Avengers, if it’s going to be more about the tragic love of Ronin and Mockingbird as shown here. The Skull Kill Krew has a lot of life in it, but it’s too ’90s for my taste, what with its anti-hero whose arm turns into a giant gun and all. 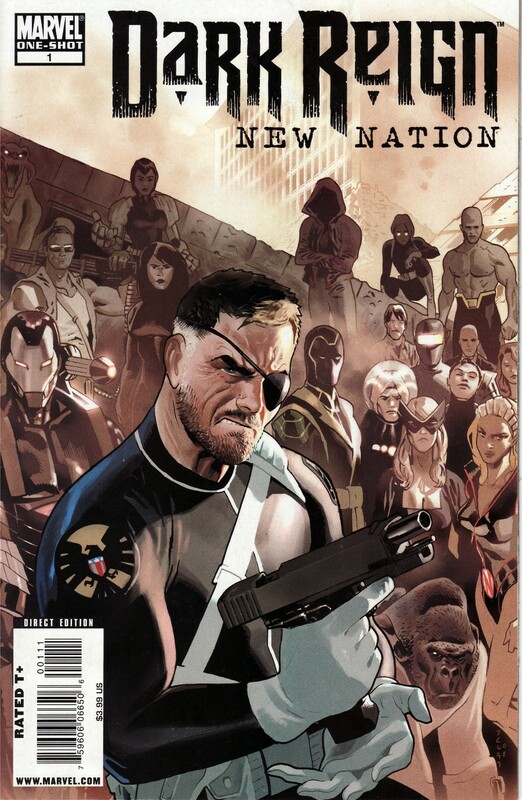 I only bought New Nation for the Agents story, but if there’s another one that gets my attention and makes me curious about the new series it’s promoting, it’s Greg Pak and Leonardo Manco’s War Machine tale. I like both of these guys already and Pak has more than proven himself when it comes to bringing the awesome. 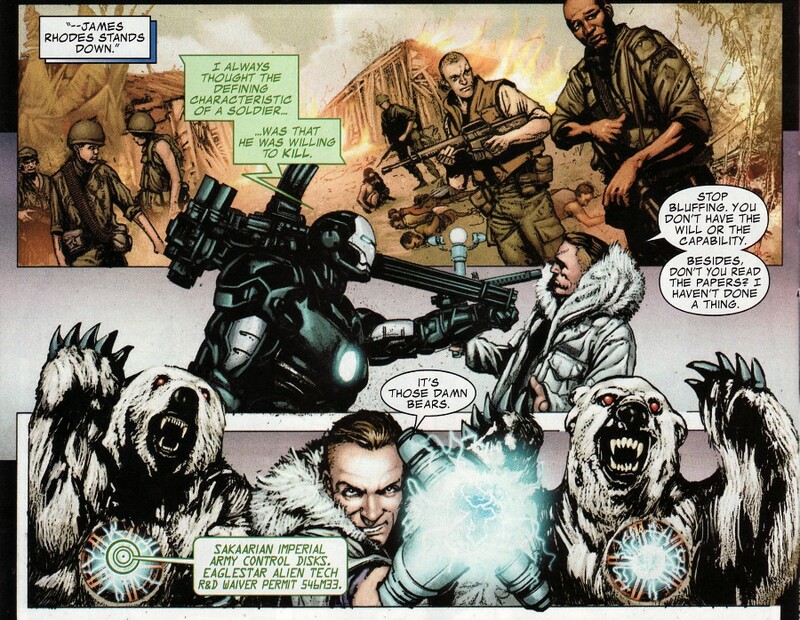 Witness this short story in which War Machine has to fight remote-controlled polar bears. If only I liked War Machine. But then, I wasn’t any kind of Hercules fan before Pak got ahold of him either. My continued interest will be largely dependent on how much Marvel’s charging per issue. I’ll probably pick it up for $3, but I’m not going to four. Edited to add: I meant to link to this interview with Jeff Parker about Agents of Atlas as long as I was talking about them, but I forgot. It’s got preview pages from the new series, so you should go look. 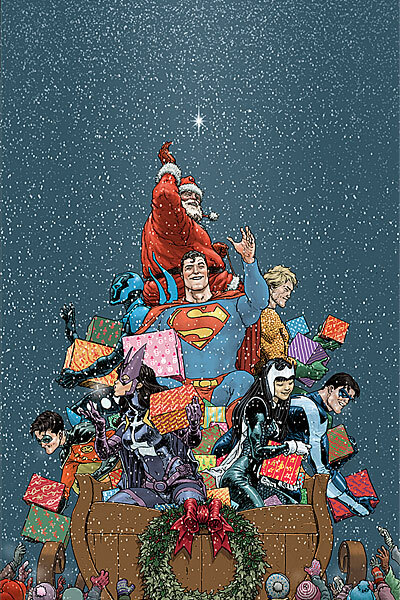 So, I gave this year’s DC Holiday Special the ol’ flip-through because I wanted to check out the Aquaman story, but didn’t want to spend six bucks on it without knowing whether or not it was lame. And it pretty much is. There’s a cool double-page spread of Aquaman using a giant squid to fight a helicopter full of bad guys (you can see it in The Aquaman Shrine’s review), but the overall tone of the story is sentimental in a corny way and if there’s one thing Aquaman doesn’t need right now, it’s corny. There’s also a trick-ending that left me staring at the final page in disgust, but I was skimming the narrative captions through the story, so maybe I missed something that would’ve made it more palatable. Judging from these reviews though, I’m guessing that’s not the case. My first reaction at seeing this was to wonder why Aquaman would need it, but after a little thought I suppose that it probably goes faster than he can swim. It’s got to be faster than a giant seahorse at any rate. 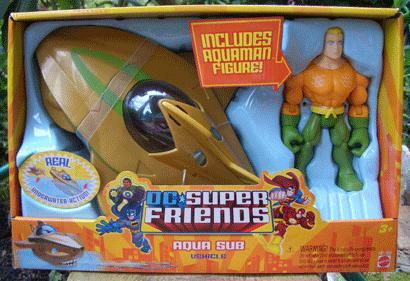 Besides, I agree with The Shrine that it’s cool to see Aquaman getting his own action figure and vehicle. I’m working on a new Hawkman comic for DC, and decided to try a newer, more fan-friendly style. What do you think? leave a comment!No title for the book yet that I know of. It’s not due for another six months. Anyway, enjoy the wallpaper! By the way, just for the fans, I’m making this story the bloodiest and most depressing story ever! Full of realism! 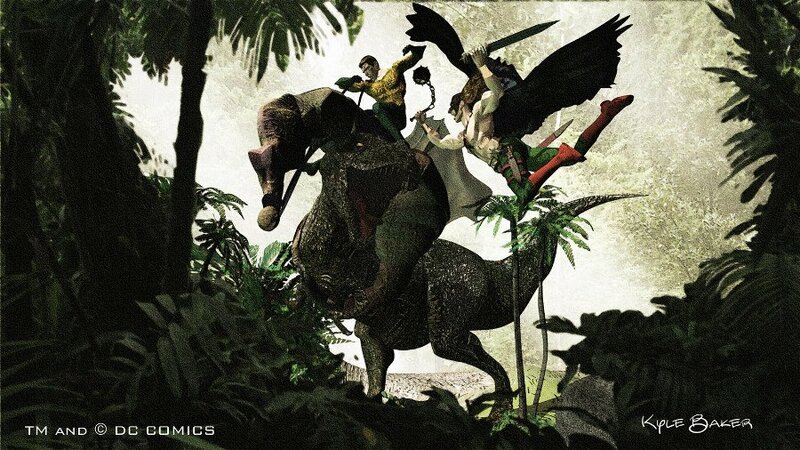 HAWKMAN’S WORLD WILL BE CHANGED FOREVER! I’ve revealed too much. I can say no more. *I can, but I won’t. Sorry. Desperado Publishing has a promising-sounding comic coming out next month. 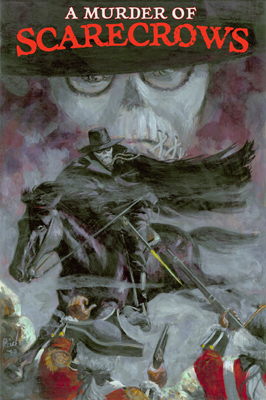 It’s cleverly titled A Murder of Scarecrows and features a pre-Revolutionary War masked man taking up arms against his British oppressors. Sounds a little like The Black Coat and a lot like Dr. Syn, but I like both of those things, so all the better. According to the press release I got, the graphic novel will run 64 pages and the story is the first in a planned series.